TriState Water Works has a licensed backflow tester on staff to test any irrigation backflow device in the state of Ohio. Currently we do not have anyone licensed in Kentucky or Indiana. What is the purpose of a back flow device? It is a plumbing device that prevents the unintentional reversal of the intended flow of water within a water system. The device protects the potable water supply from contamination in what is known as a Cross Connection. A cross connection is a situation where the potable water supply is connected to a known hazard such as a lawn sprinkler system, swimming pool, boiler, medical facility and many other situation that have real or potential contaminates. 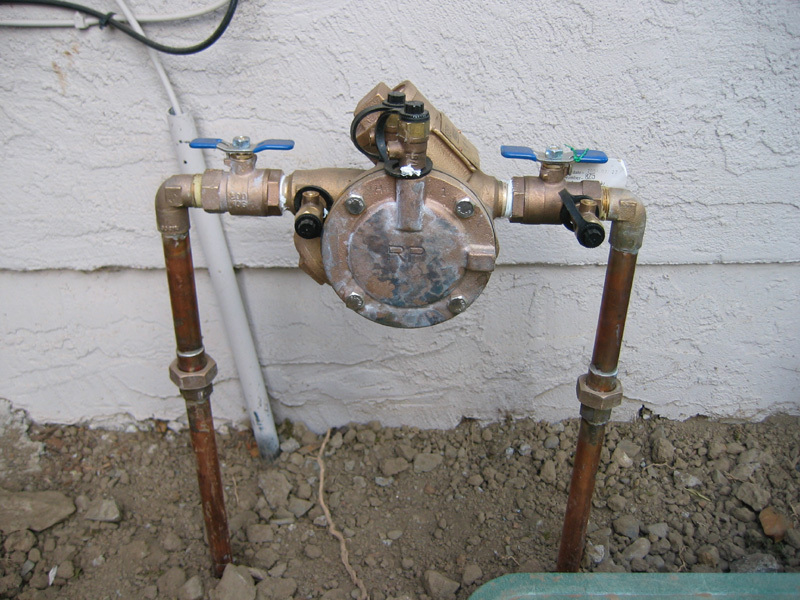 There are two general conditions that can cause a backflow event they are: Back Pressure and Back Siphonage. Back pressure is caused when the water pressure in the use area or hazard area is higher than the supply pressure. Back Pressure can be caused by boilers, pumps, elevation changes, and chemical processes. Back Siphonage is caused by a lowering of the pressure in the supply side. Back Siphonage can be caused by a water main break, high water demand or pumping water from fire hydrants for fire suppression. What is the likelihood of this happening? It happens everyday in every water supply system, it is part of the physics of a municipal water system, so it is very important to have a properly functioning backflow device on all cross connections especially lawn sprinkler systems to prevent any contaminated water entering your drinking water. So the first step is to make sure you have a backflow device on your lawn sprinkler system. There are several types of backflow device in use today. Each type of backflow device is designed for a specific situation and type of contamination. Lawn sprinklers are considered a high hazard and in most municipalities require a Reduced Pressure Assembly (RPA) type of backflow. The RPA provides the greatest level of protection. Some municipalities allow other type of devices, you should check with the governing authority to determine what device is required, or use the RPA which is generally accepted by all municipalities. The device needs to be tested on an annual basis to make sure it is working properly. TriState Water Works can provide backflow testing and documentation to comply with Ohio’s revised code on backflow testing. When you get your notice from the governing authority call TriState Water Works at 513.379-5780 to schedule the testing of your backflow. Should your backflow device need repairs,TriState Water Works can repair, service and install irrigation lawn sprinkler backflows. Other than testing, what else needs to be done to prolong the life of your backflow? A backflow will work properly for many years if proper care is given it. Dirty water and debris can be a cause for failure of a backflow device. Sometimes a strainer or filter is installed before the device to keep contamination out of the unit. The most common failure of backflow devices is caused by freezing. In most cases the backflow is located outside, for good reason and is subject to freezing weather in late fall if it is not winterized properly. The backflow device is the first item to freeze on a lawn sprinkler system because it is elevated and exposed to the cold air. All of the other components of an irrigation system are generally buried in the ground and protected from freezing until the weather stays cold for a very long time. If your system has not been winterized and a cold snap sets in be sure to cover your backflow with an insulated blanket that drapes over the backflow and touches the ground. You want to capture any warmth from the ground under the blanket and around the backflow. It is also best to remove the backflow and store it in a freeze free location for the winter, this will add many years to the life of the backflow. If your backflow fails the test or breaks is it best to replace with a new one or to repair the existing device? The answer to that question depends on several circumstances. If the device has been subject to freezing and is cracked or warped replacing the device is the only solution to your problems. If the device has not been subject to freezing and is just old or dirty the best course of action is to rebuild the unit with a rubber gasket kit. The cost of a new backflow for a residential 3/4 inch backflow starts at about $350.00. The cost to repair the same backflow is about $200.00 or less depending whether it’s a complete or partial rebuild. If you have any further questions or concerns about backflow preventers please feel free to call us at TriState Water Works at 513-379-5780.